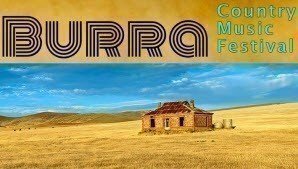 The historically intriguing, and picturesque town of Burra comes alive for three days of amazing entertainment. Located at the local showgrounds, this festival is one to rival others; with 3 days of fun, music and food/ beverage vans galore, camping on site, national quality artists, and an atmosphere like no other. Providing both excitement and amusement for the whole family. Be sure to put this festival in your calendars. Book early. Prepare for good food, good drinks, great music, and amazing times; after all, Burra Burra means 'Great, Great.' Licensed Bar, no BYO, no GLASS. Line up consists of award winning performers: Rock Band(SA) FRIDAY NIGHT ONLY, Rock & Roll Demonstration on Friday Night. - All attendees require a valid ticket to gain entry to the Festival. Please print your ticket/s (or show them on your smartphone) and present them on arrival for scanning. - Tickets are non refundable but are transferable to other people. Friday night kicks off with the popular " Rock Band" Friday night only. Friday: Food stalls will be available from 6pm and all of the weekend for food & Drinks. Licensed Bar Friday & Saturday NO BYO Alcohol or GLASS allowed. Saturday Talent Quest – You can use this event as a platform to improve your skills, make new friends and have some FUN. Nurturing YOUNG TALENT, and providing an opportunity to perform, gaining experience and confidence. FREE Workshop and recording, followed by a first class line-up of local and interstate entertainers. Saturday artists: DREW McALISTER, SELEEN McALISTER, PETER COAD & THE COAD SISTERS, ALAN CASWELL, DWAYN ELIX, SANDI DODD, JOHN TURNER Jr, KIARA MERCER and JIM HERMEL & RUNAWAY DIXIE others TBC. We advise to book your accommodation early! The festival grounds offer camping to ticket holders only. They require a ticket number on booking so you must purchase tickets first. For Powered site & Ticket enquiries please phone Karen on 08 889 22 614. Or email us using the Contact Organiser link on this page.